Samadhi of Suhotra Maharaja needs your help!!! Dear disciples & well-wishers of Suhotra Maharaja! I would like to inform you in brief about the facts regarding the construction of Suhotra Maharaja’s samadhi in Mayapur Dham. The samadhi project could also include Suhotra Maharaja’s room, where he was staying the last years of his life. That room after necessary renovation would become a part of Gurukul’s temple complex and serve as pujari-room & memorial of Suhotra Maharaja. The other option would be to demolish it, but many devotees wanted that room to be saved. 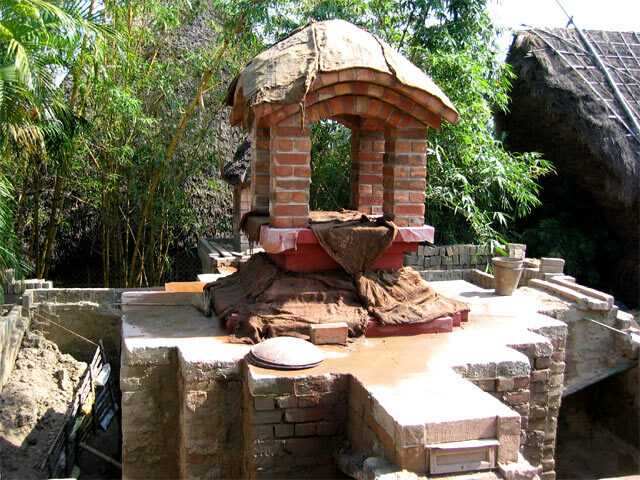 It was built by the Gurukul and they also took care of all the expenses at that time. Now they could also use that in the line of developing the Gurukul and their temple room. According to Shanti Parayan Prabhu the room would become very nice in the same mood as it was with Suhotra Maharaja. Apart from that there is of course construction of Suhotra Maharaja’s Samadhi which is allowed to come to the top of his room, the place where he made the yajnas. There is already a temporary samadhi and his ashes are placed there. Great well-wisher of Suhotra Maharaja, Santi-Parayan Prabhu (IDS) has been taking part in development of Samadhi’s plans and contracting the artists who can build it. We are very much grateful to him for this wonderful service he is doing. Santi-Parayan Pr. has prepared serious cost estimate for designing and building of Suhotra Maharaja’s Samadhi and Room-memorial. The total cost is around 150.000-170.000 INR which is about 3.500 EURO. Finnish devotees have already paid for funeral expenses(350 EURO) and they will still collect more. Czech and Romanian yatras have donated already something, while Polish yatra is intensely working on collection. Tapas Prabhu has also promised to support. We humbly ask all of you to contribute something for this project. All the donations can be given to Vidyagati Prabhu (Praha, Czech Republic) who after collection shall pass all the funds to the construction team working in Sridham Mayapur. If you are from Czech, you can also give him laxmi personally, as it saves bank fees.